September 24th in Wordpress Plugins by Wordpress Jedi . Twitter is still one of the most popular social media sites around. It can drive a significant amount of traffic to your website if you play your cards right. Better Click To Tweet for WordPress is one of many plugins you can use to encourage your visitors to share your stories with their friends. 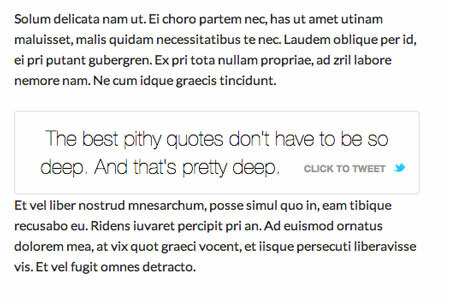 Better Click To Tweet lets you create tweetable content for your readers. Simply use the shortcode available to wrap passages in your posts. You do have the option to click on the blue bird icon in the Visual Editor to apply the shortcode. Those of you who know design and coding can apply custom CSS rules to customize the look and feel of this plugin. You can download it for free at this time.